Foundation and face powder are the important things in makeup step for me because both products are the base that will even out your face complexion. So, ULTIMA II sent me three shades of foundations that were called ULTIMA II Delicate Crème Makeup and two shades of ULTIMA II Delicate Translucent Face Powder With Moisturizer. It came in a silver box with a little touch of black. As I stated before, I got three different shades of this ULTIMA II Delicate Crème Makeup which are 01 Ivory, 03 Peach and 04 Buff. The packaging of the ULTIMA II Delicate Crème Makeup was cool in my opinion. It was all shiny silver and I even can use it as a mirror without opening the lid. Oh yeah, the ULTIMA II Delicate Crème Makeup is a cream foundation that is packed in a compact packaging. When you open the lid you’ll find the product and a mirror also you’ll find the sponge under the product container. I like this kind of compact that separate the sponge and the product because of hygiene reason. ULTIMA II Delicate Crème Makeup contains collagen that supports your skin care routine. It is claimed that the ULTIMA II Delicate Crème Makeup has medium to full coverage that can cover your skin’s flaw and has glowing finish that suitable for Korean makeup look. Oh yeah it also said that it will give you poreless skin finish. 01 Ivory, has a slight pink undertone that suitable for those who has fair skin. 04 Buff, is the darkest shade that I have. It has slightly orange undertone with more visible brownish shade. It suitable for those who have ‘sawo matang’ skin tone. You can see the comparison of each shade on my skin. Okay here’s the thing, I personally think none of three shades that I have is match to my skin tone. I mean one shade that I can use to cover my whole face. Why? Because my skin has yellow undertone and none of three shades of ULTIMA II Delicate Crème Makeup that I have has yellow undertone in it. 01 Ivory is too light for me but I think it’s still ok if I use it for my entire face with thin layer of it. 03 Peach is too pink-orange on me. 04 Buff is too dark for my skin tone. At first, I thought it will suitable if I apply 04 Buff on my entire face, but my sister said that my face look dark when I use 04 Buff alone. It turned out that 04 Buff matched to my sister’s skin tone perfectly (she has slightly darker skin tone than me). But I find each shade of ULTIMA II Delicate Crème Makeup that I have, could be applied for different purpose on my face that I will explain later in this post. Oh yeah, this cream foundation will turns into powdery finish without any heavy feeling that usual cream foundation will do. 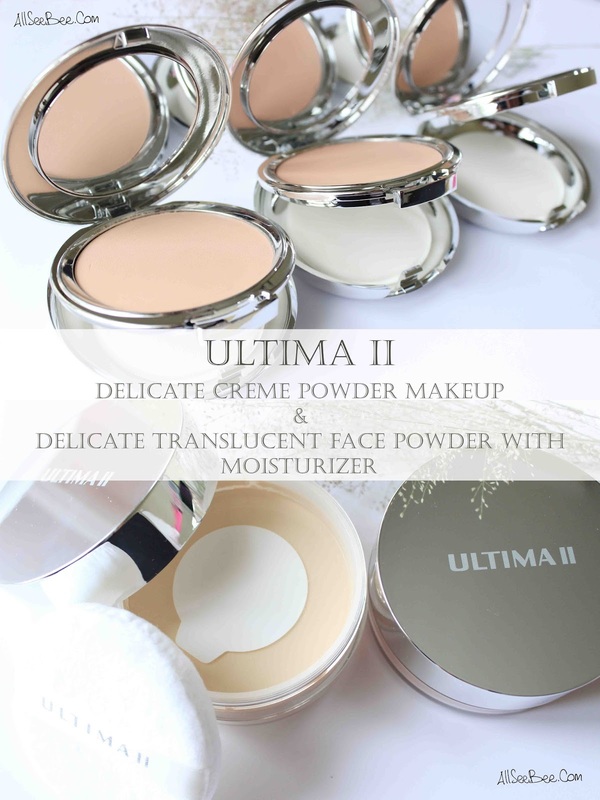 This ULTIMA II Delicate Crème Powder Makeup is sold for IDR 200.000 and you will get 13g of products. This time, let’s talk about ULTIMA II Delicate Translucent Face Powder With Moisturizer, the powder that match perfectly for the ULTIMA II Delicate Crème Makeup. ULTIMA II Delicate Translucent Face Powder With Moisturizer came in same box as ULTIMA II Delicate Crème Makeup. I got two shades which are 005 Pink Shell and 021 Neutral. The packaging has this shiny lid that (again) I can use as mirror. Just like common face powder, the packaging came in screw lid and you will see a large puff in it. Look at the powder puff! It so thick and large! I looove it! Under the puff, you will get the container separator that was sealed. ULTIMA II Delicate Translucent Face Powder With Moisturizer also contains soluble collagen powder that makes it a perfect pair to the ULTIMA II Delicate Crème Makeup. ULTIMA II Delicate Translucent Face Powder With Moisturize is claimed will disguise skin’s flaw, hide fine lines through optical illusions that is created by micro shimmers, gives a healthy radiant glow and of course moisturizing your skin while doing all its jobs. Oh yeah, the ULTIMA II Delicate Translucent Face Powder With Moisturizer available in five shades that suitable for Asian women's skin tone. Here you can see the color difference between 021 Neutral and 005 Pink Shell through its separator. 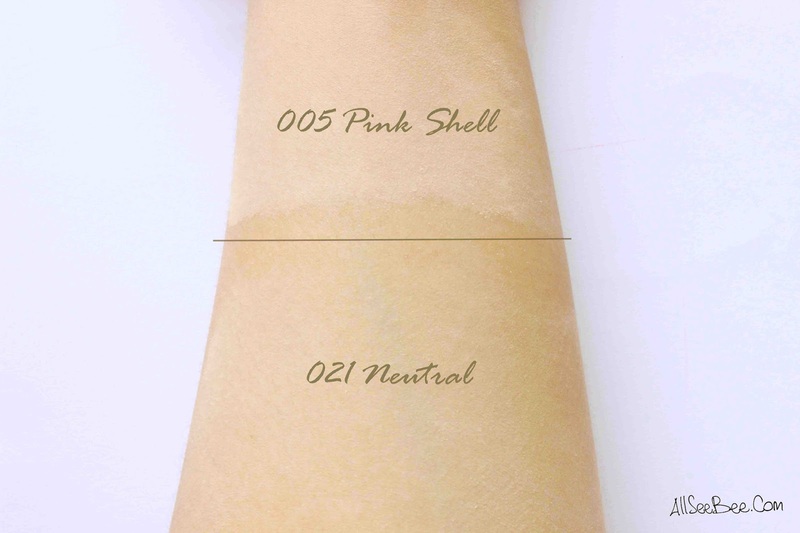 As you can see, the 021 Neutral has obvious yellow undertone in it and the 005 Pink Shell has (as its name) pink undertone. Here is the comparison of ULTIMA II Delicate Translucent Face Powder With Moisturizer on my skin. For my skin tone, the shade 021 Neutral match perfectly. It makes my skin looks slightly brighter and also glowing. Oh yeah, it also makes my skin feel smooth. As I stated earlier that the ULTIMA II Delicate Translucent Face Powder With Moisturizer has micro shimmers in it, but somehow the 005 Pink Shell has more visible shimmer compared to the 021 Neutral one in my opinion. It probably not that visible on the swatches that I give to you in this review, but in real life it looks so obvious. This ULTIMA II Delicate Translucent Face Powder with Moisturizer is sold for IDR 165.000 and you will get a lot product because it contains 43g. It could last for a year or more than a year if you use it for yourself. Hahaha, I mean it! Okay, let’s see how both ULTIMA II Delicate Crème Makeup work and ULTIMA II Delicate Translucent Face Powder With Moisturizer on my face. As you can see, I have dark under eyes area a.k.a. panda eyes and some blemishes right under my lips and a blemish on my left cheek. Okay, let’s see how the combination of three shades of ULTIMA II Delicate Crème Makeup on my face. I used the ULTIMA II Delicate Crème Makeup in 03 Peach for my under eye to conceal and brighten my panda eye, oh yeah, I top it off with a little 01 Ivory shade. I used the color 01 Ivory on my T zone, chin and brow bone to give a subtle highlight and I also applied the color 04 Buff on my nose and cheek for a subtle contour. You have to remember the rule on applying cream foundation including this ULTIMA II Delicate Crème Makeup, that you have to tap and press the areas and do not drag the puff or your finger. And yes! My skin’s flaws all covered perfectly without any concealer! As you can notice, my under eye and blemishes under my lips covered perfectly. So, the full coverage claim is true. Okay, let’s see how it looked with the ULTIMA II Delicate Translucent Face Powder With Moisturizer. This is how I look after I apply the ULTIMA II Delicate Translucent Face Powder With Moisturizer. Yes, my face looked matte. But, not a dead matte because the ULTIMA II Delicate Translucent Face Powder With Moisturizer has micro shimmers in it that made my face more radiant. Besides that, my face also looks and feels smooth. I apply the ULTIMA II Delicate Translucent Face Powder With Moisturizer at 13.29. I intentionally put the time code here to show you how the ULTIMA II Delicate Translucent Face Powder With Moisturizer works on my face. And, this is how I looked like at 16.46 with full makeup on. Oh yeah, I didn’t do any touch up for foundation or powder. As you can see, my face looked greasy, I know. But the greasy look that I get from the combination of ULTIMA II Delicate Crème Makeup and ULTIMA II Delicate Translucent Face Powder With Moisturizer was more like healthy-Korean-kind-of-greasy-look which made me has this glowing from within effect. Staying power of this dynamic duo, I have to say about six hours and then I notice the foundation on my nose area starts to fade away. Overall, this Dynamic Duo from ULTIMA II is perfect for those who want to achieve glowing skin look with full coverage and poreless finish, just like the famous Korean Makeup look like. So, how is it? if you are interested and want to try it out in real life, you can get these ULTIMA II Delicate Crème Makeup and ULTIMA II Delicate Translucent Face Powder With Moisturizer by offline and online way. Okay, that’s all my review for ULTIMA II Delicate Crème Makeup and ULTIMA II Delicate Translucent Face Powder With Moisturizer. Thank you for stopping by and reading my review.